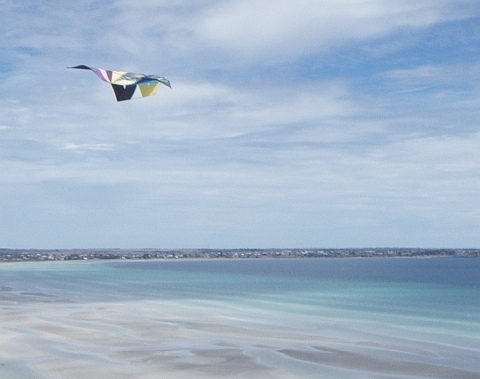 The local kite club had been invited to put some kites over Flaherty's Beach as part of an unusual golfing event. Some visual eye-candy in the sky always helps to draw a crowd! The lengthy and descriptive title of this event was the 'Sandbar Golf Classic And Family Fun Day 2017'. 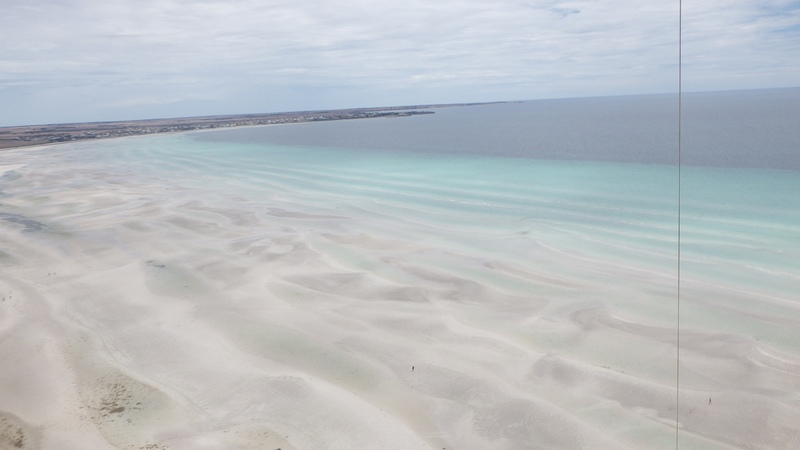 A spot of local geography is in order here... Flaherty's Beach is 5km North of Warooka, on York Peninsula in South Australia. Only 10's of km away from where I was born, in the small country town of Minlaton. 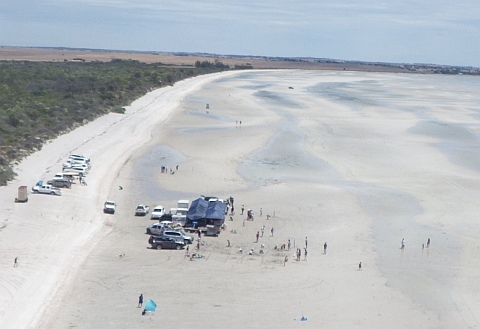 After missing the turnoff and then finding our way back to the beach from Warooka, a kite or two appeared just above the horizon. A good clue that we were on the right gravel track as we drove through the thick scrub towards the sand. A short trudge over a dune and there it was - tents, vehicles, people and ... kites! Nothing huge, but a head-turner for those whose last involvement was making a simple newspaper Diamond in their youth. So far, struggling in marginal winds was a flat Parafoil, a Delta Conyne and a novelty inflatable shaped like an elephant's face and trunk. 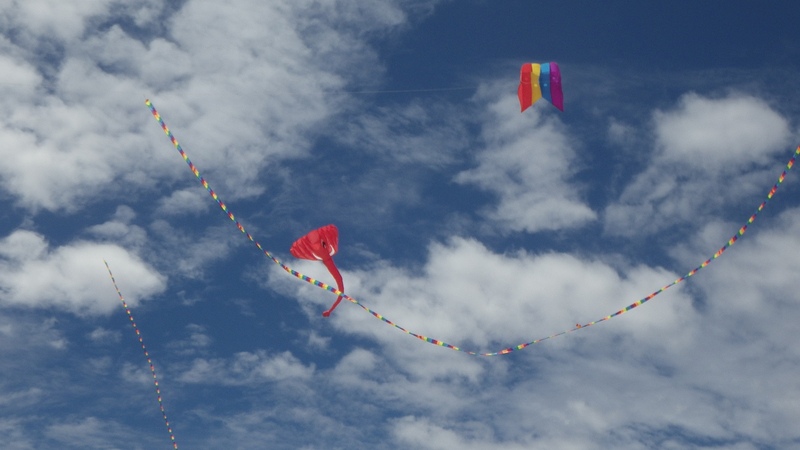 Plus a few thin banners and tails hanging from lines and kites. 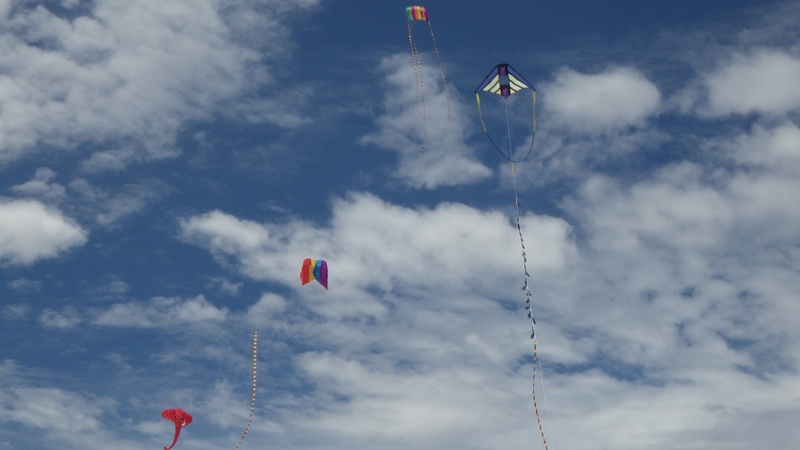 See these kites in the first 4 photos below. Soon we had the red Tyvek Roller in the air. A lot of line was let out with the kite hanging close to the sand. But finally a few tugs succeeded in urging the Roller up into faster air. And there it hung for a couple of hours at 200 ft while I got busy with some KAP (Kite Aerial Photography). 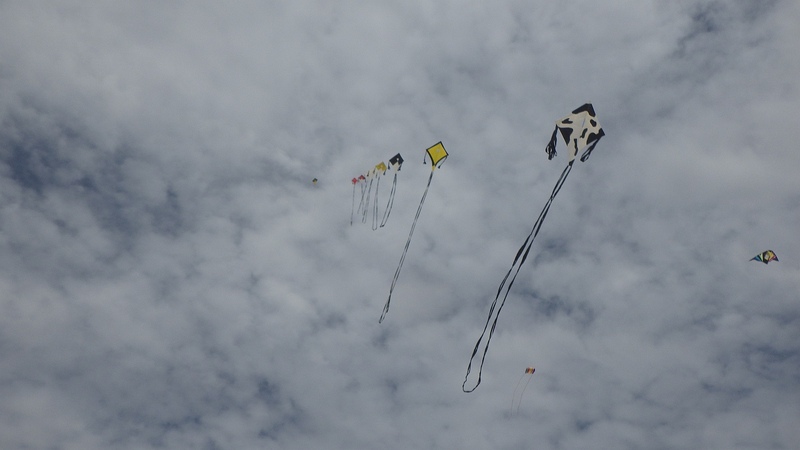 More on that KAP further down, but I'll mention the lifter kite... The air being so light initially, we used the 2m tall Carbon Diamond. So-called for it's carbon-tube 2-piece vertical spar and carbon-rod horizontal spar, also in 2 pieces. However, the breeze was picking up! Finally, we put up a 9-Diamond train which flew steep and steady in the smooth airflow. See the last photo in the gallery below. Due to the almost constant wind speed up the entire length of the train, it pulled like never before! The spring scales showed 4.5 to 5 kg. 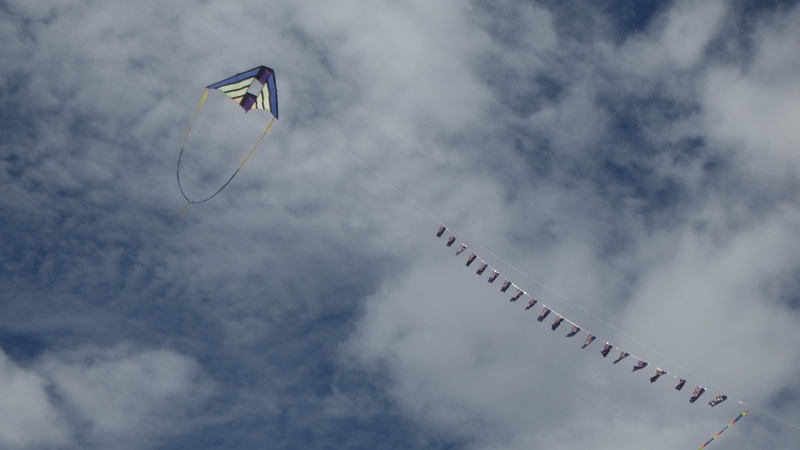 Before we kite club people left, it became clear from short conversations with locals that our kiting display had definitely been appreciated! As the afternoon wore on, the on-and-off very light conditions freshened into a decent gentle-to-moderate sea breeze. 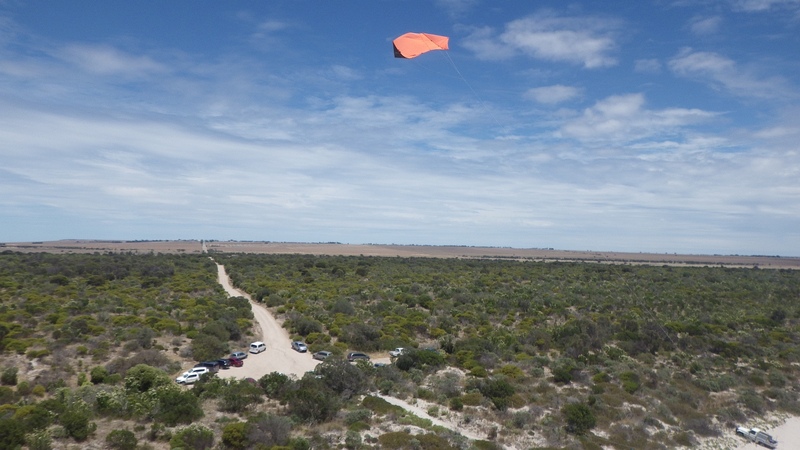 Several KAP flights were done with my big 2m (7ft) tall Carbon Diamond. The kite needed some careful trimming to stay centered since it was a light-wind design flying near the top of it's wind range. Camera direction and height were varied from flight to flight. 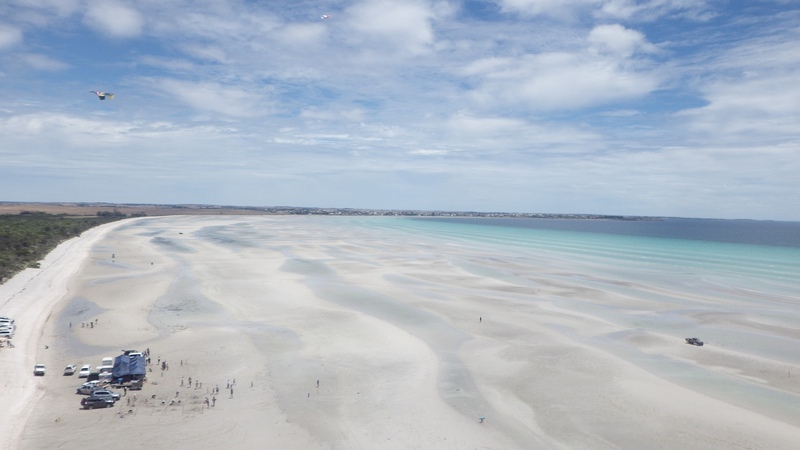 Also, some walking up and down the beach gave different perspectives of all the activity. Oh yeah, the golf was the main attraction! Better mention it then ;-) All through the day, small groups of people could be seen around the various golf holes up and down the beach. For anyone out of town, it really would be something different. 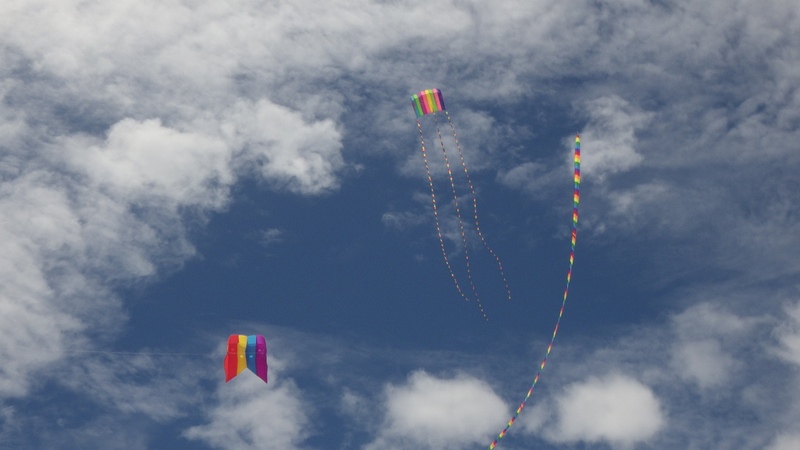 A bunch of blokes walked past and commented favorably on the kites. Good! It was a long way to drive - around 3 hours - but at least the weather turned out to be great for golfers and kite fliers alike!